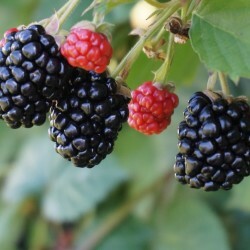 When fully ripe, blackberries will separate from the plant with only a small tug. If you have to pull at all, leave it to ripen. Ripe berries will be dark purple-black. Even the inner part, the receptacle, should be a shade of purple and not white. Don’t fill containers too full. The berries are delicate and will crush easily, especially on a hot summer day. If you need more containers, we’re happy to supply them! Other berries are available to pick throughout the season, starting with strawberries, continuing with raspberries and blueberries, and then fishing up in the fall with kiwi berries and our fall crop of raspberries. Explore our blog for blackberry recipes, like Blackberry Margarita Freezer Jam from Phoebe’s Pure Food and Berry Crisp from Pastry Chef Instructor Diana Penn.